For the longest time I’ve said that I’ve wanted to design and build my own game. Well now I have and it’s called Script Kittens. The game is kind of a hack, but before the details let me give a little back story. The first time I realized that people actually got paid to make video games my world changed. I made the discovery in the late 90’s, around 10 years old while reading through an instruction manual for some Nintendo 64 game. Yes back in the day video games were delivered in physical form & came with paper bound instruction manuals, nature be damned. It’s was probably Mario 64, or The Legend of Zelda. At the end of the booklet where a list of the credits, with all the creators names and their job titles. Middle class American upbringing had already drilled into me that the life plan was to go to school, finish college, and then get a job for some cooperation with benefits. The good old American dream. So I made the connection that maybe I could make games for a living. A passion for gaming did get me into learning to code, back when doing so was mostly for nerds and geeks. Still after all these years I still haven’t designed my own game until now. The game has been going by the name Script Kittens. It’s not a video game. It’s a card game, & no you can’t buy it anywhere. It’s free! By free I mean you need to print, cut, and then sleeve the cards on your own dime. Script Kittens is a press-your-luck style card game for 2 – 4 players. Designed, and illustrated by Saeed Gatson (yours truly). You play as inexperienced hackers who are trying to collect at much valuable data as possible. Your turn starts by flipping over one card. You’ll then have the option to collect the data found or press your luck by turning over another card. Every card turn can lead to more valuable data but also holds the risk that you’ll getting caught. Here are all the files you need to make your own copy of Script Kittens. The card file has all the cards need to play the game, you’ll just have to print each page once to make the 52 card deck. You’ll also need 1 six-sided die. For help on making your own cards, check out James Ernest’s “How to Make Cards” video. I had a bunch of card sleeves laying around so I ended up printing the cards on plain printer paper and then sleeving them. Only took a few minutes. So this is the first game design that I’m releasing to the public in any way (even though it’s still a Beta release). I’m planning to continue working on more projects like this in the future so any feedback you have would really help me on my journey to create more games. Hey there, I know this is extremely late but hello. Your game looks pretty interesting, but the score counting in the rulebook sounds confusing- so how does it actually work? Hey no worries, I can try rewording so it’s a bit more clear. In the deck there are multiple cards of the same type. In the rule book they’re called suites. They’re cards that all share the same abilities and have a matching symbol. However each card in a suite has a different numbered value in the top left corner of the card. 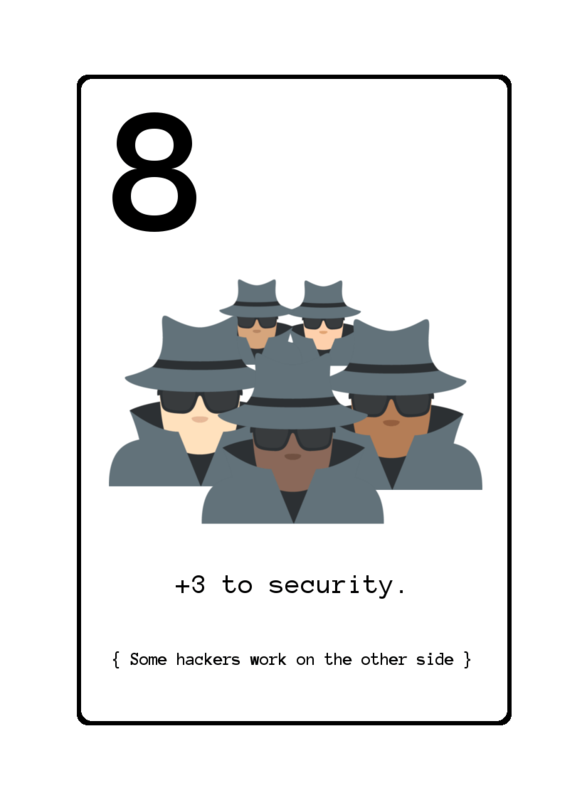 For example, there are 8 Security Cards (fire symbol) in the deck with the numbers 1 – 8. Lets say you’ve collected the number 6 Security Card, number 4 Security Card, and number 1 Security Card. At the end of the game you would receive 6 points from this suite. That’s because number 6 Security Card is the highest valued Security Card you’ve collected. To come up with your total score, a similar thing would be done for the other card types collected.